This species is sometimes confused with the congener B. merah. Some individuals appear redder than others. brigittae: named for the author’s wife. Appears to be endemic to southwestern Borneo though occurence records are scant. The type locality is ‘Bandjarmasin’, a port town in the Indonesian province of Kalimantan Selatan (South Kalimantan), and following Kottelat (1991) it’s range extends westwards as far as the Jelai Bila river basin, near the town of Sukamara, where it’s said to occur sympatrically with the congener B. merah (but see ‘Notes’). Inhabits black water streams and pools associated with ancient forest peat swamps. The water is stained brown due to the release of tannins and other chemicals released by decomposing organic matter and the substrate scattered with fallen leaves, twigs and branches. Such environments characteristically contain very soft (negligible hardness), acidic (pH as low as 4.0) water and are often dimly-lit due to dense marginal vegetation and the forest canopy above. Across much of Southeast Asia these precious biotopes are under threat from rubber or palm oil plantations, building developments and other human activities. Though small it still needs space to swim and dominant males will form temporary territories when spawning so a group is best kept in an aquarium with base dimensions of at least 45 ∗ 30 cm. Best maintained in a densely-planted aquarium and is an excellent choice for the carefully-aquascaped set-up. The addition of some floating plants and driftwood roots or branches to diffuse the light entering the tank also seems to be appreciated and adds a more natural feel. To see it at its best a biotope-style set-up can also make an interesting project. A soft, sandy substrate is probably the best choice to which can be added roots and branches, placed in such a way that plenty of shady spots are formed. Fairly dim lighting should be used to simulate the conditions the fish would encounter in nature. You could add aquatic plants that can survive under such conditions such as Microsorum pteropus, Taxiphyllum barbieri or Cryptocoryne spp. Do not introduce any Boraras sp. to a biologically-immature aquarium as they can be susceptible to swings in water chemistry. 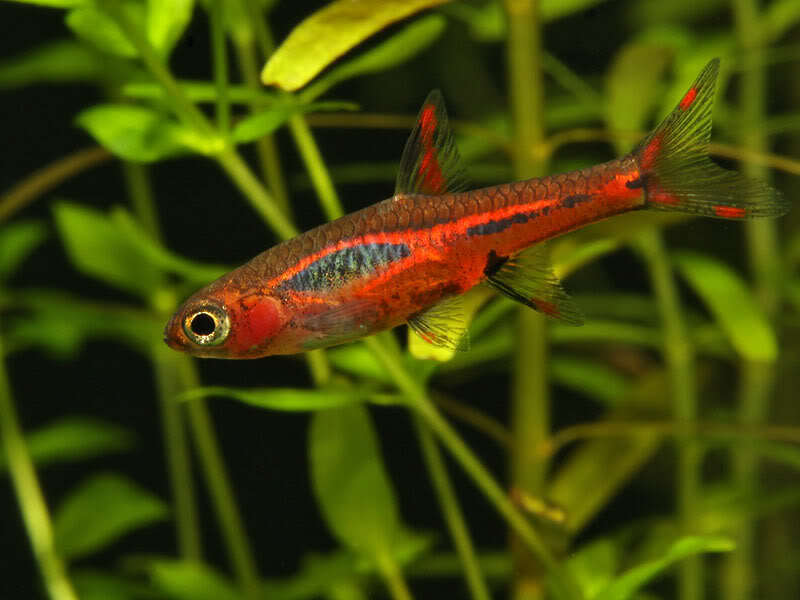 As with other Boraras species it is likely to be a micropredator feeding on small insects, worms, crustaceans and other zooplankton in nature. In the aquarium it will accept dried foods of a suitable size but should not be fed these exclusively. Daily meals of small live and frozen fare such as Daphnia, Artemia along with good quality flakes and granules will result in the best colouration and encourage the fish to come into breeding condition. While this species certainly will eat its eggs it appears not to actively hunt for them as is the case with many small cyprininds. Once spawning has commenced it should continue on a daily basis. The congener B. urophthalmoides is often traded as B. brigittae, presumably in order to obtain a more favourable price. 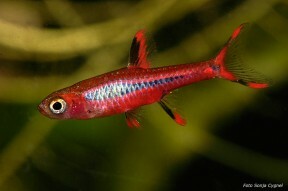 Though these are similar in that they’re the only two members of the genus to possess a dark lateral body stripe B. brigittae is easily identifiable by its larger adult size, lack of distinct dark blotch at the caudal peduncle, comparitively short, often broken lateral stripe and overall brighter, more uniformly red patterning. It’s sometimes seen on sale with the alternative vernacular names ‘chili rasbora’ or ‘dwarf rasbora’. 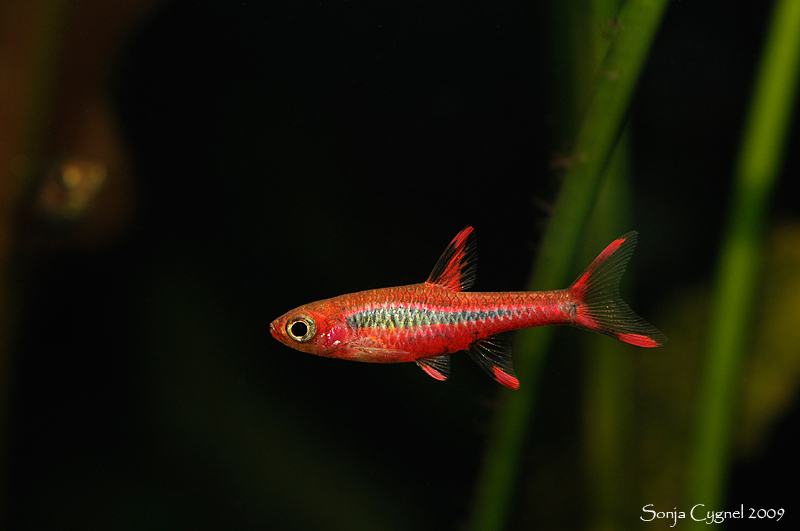 B. merah is also similar-looking but it lacks colour in much of the body with the red pigmentation tending to be concentrated around the dark body markings which do not usually form an unbroken stripe. Striped male individuals do exist, however, and this has led to speculation that B. brigittae and B. merah are the same species (Körner, 2010). The same author also reported that in an ‘eastern’ population (from the area around Banjarmasin?) 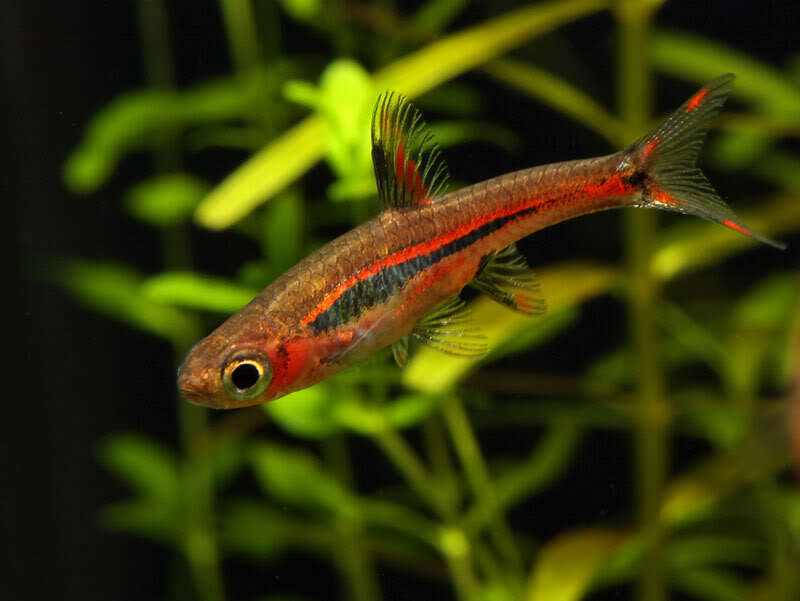 both sexes develop a striped pattern before maturity, while in the ‘central’ population (Palangkaraya, where fish are collected for the aquarium trade) only males develop the striped colour pattern, and only when sexually mature. 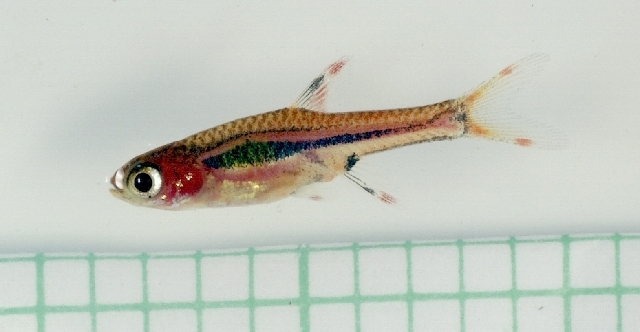 Kottelat (2013) argued that the different ontogenies in colour pattern, and presumed geographical distribution of these two populations, supports the existence of two species, whilst also noting that Palankaraya is not close to the type locality of B. merah; the Sungei Jelai Bila river basin in Kalimantan Tengah, much further west. 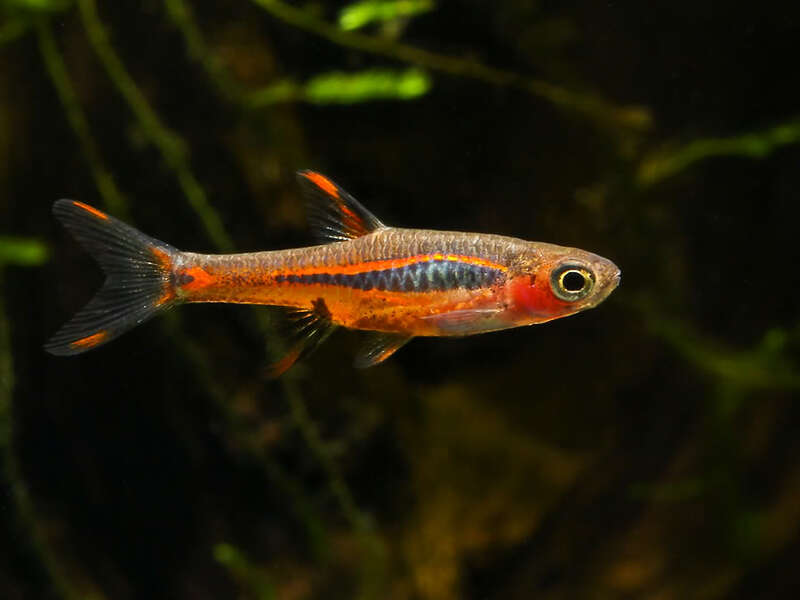 Neue Erkenntnisse aus Südborneo einer vorläufigen Beschreibung von Rasbora uropthalma brigittae n. ssp.